Time to teach nonfiction text structures! 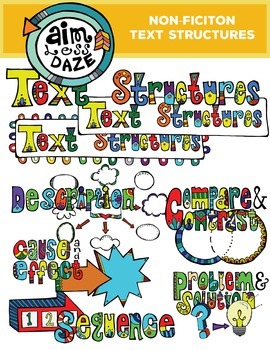 Create some bright and exciting posters for you classroom or TPT store. Create wonderful handouts to get your students ready to learn! All images are color and lined. You may use the images for your own personal crafty creations, either digitally or in print.NOT FOR CLIPART. For personal use credit is not required but appreciated. All commercial use requires credit given and if possible a clickable link back to the site. If you are a teacher and find that giving credit it too much of a hassle, contact me and we can work something out.